The way that Americans feel about guns has undergone a sudden and unexpected change since the attacks of 9-11. Regulatory agencies, gun retailers, and safety instructors all report a sharp increase in activity. Many purchasers are women, first-time buyers, and those who previously held anti-gun views. Societal issues normally undergo gradual, pendulum-like swings, but this one is changing with astounding speed. It took roughly forty years for the gun control movement to convince a large portion of the population that guns caused violence and were too dangerous for ordinary citizens to possess. It has taken less than one year for the tide to change. The most obvious reasons for this rapid transformation are directly related to the terrorist attacks. For example, the almost unanimous call for military action makes it seem hypocritical to label guns as evil instruments when we are asking our military to wield them on our behalf. The fact that the attacks were carried out without a single gun was a wake-up call to even the most ardent anti-gun activists. While they were concentrating on the dangers of guns, they ignored the reality that people with evil intent are the real threat. "This started out as a documentary on gun violence in America, but the largest mass murder in our history was just committed -- without the use of a single gun! Not a single bullet fired!... I can't stop thinking about this. A thousand gun control laws would not have prevented this massacre. What am I doing?" I believe this widespread attitude adjustment would have been impossible if not for the results of the last presidential election. 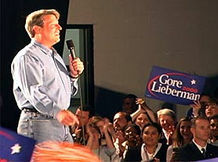 Political analysts declared that support for tougher gun control laws lost the election for Al Gore. Although this is probably an exaggeration, Democratic politicians fled from the issue as if it were the kiss of death. Liberal voters were free to rethink their position on guns without feeling disloyal to their party. They began to notice the failure of gun control laws and "gun free zones" in other countries, as well as in various states and cities. They started reading articles by Prof. John Lott, author of "More Guns, Less Crime." Doubts developed about the politically correct view of gun ownership. These doubts suddenly fit in with the new picture created on 9-11. As soon as details of the box cutter hijackings became public, millions of people shared a single thought. These attacks never would have succeeded if a single person with a handgun and a cool head had been in the right place at the right time. The ease with which terrorists eluded our security measures made us all aware of how vulnerable we are. Terrorists have the luxury of striking at a time and place of their choosing, while we must defend all possible targets at all times. The next attack could easily disable large sections of the electric power grid, resulting in extended blackouts and a breakdown in social order. Today's neophyte gun buyers are probably less concerned with fighting terrorists than with a scenario similar to the last round of riots in Los Angeles during which police abandoned large areas of the city. In the resulting rush to local gun stores, many were dismayed at the long waiting period required before they could take delivery of a firearm that would allow them to protect their families. The anti-gun lobby would like us to believe that new gun buyers are acting out of blind fear, but most are undergoing a sober and thoughtful re-evaluation that began prior to the attacks. Before 9-11, many people were still in denial about their own vulnerability to danger. It was easy to believe that we could always dial 911 and instantly summon armed officers to our rescue. The lesson that many Americans have taken from this experience is that we should each take more responsibility for our own safety. Seeing so many innocent lives snuffed out without warning has injected a harsh dose of reality and relieved us of some of our idealistic innocence. Dr. Michael S. Brown is a member of Doctors for Sensible Gun Laws. He may be reached at rkba2000@yahoo.com. ESR anti-gun control gear - T-shirts, caps, mousepads, shirts, sweatshirts and more!